Was listening to some NPR podcasts at work whilst doing admin stuff, as I am wont to do. 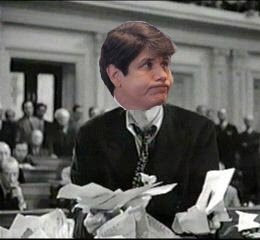 This one on Blagojevich cracked me up in particular. Blagojevich is apparently a bit of a cinephile and has been likening his current situation to that of the heroes of old movies. Every time I hear this guy open his mouth I realize more and more what a complete nutter he is. He says he is the man who's enemies say they'll give him a fair trial right before they hang him in the cowboy western Silverado. He is good ole Jefferson Smith fighting against the corrupt establishment in Mr. Smith Goes to Hollywood. And he is the misunderstood marathon runner (who uh, by the way was in reform school?) 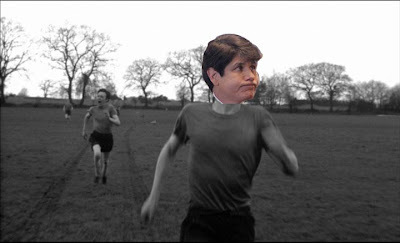 in The Loneliness of the Long Distance Runner. These were his beliefs, not mine. P.S. To answer your question-Yes! I can be commisioned to do Photoshop requests!